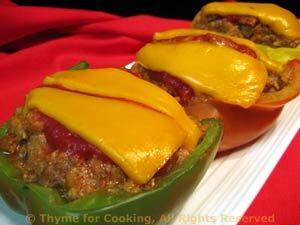 Bell Peppers, Stuffed American Style, Thyme for Cooking one dish dinner. Peppers: Put a large pot of water on high heat and bring to a boil. Stuffing: Chop onion, celery and garlic. In nonstick skillet heat oil over medium-high heat. Sauté chili powder for 1 minute. Add garlic, celery and onion, sauté until tender, 5 - 7 minutes. Add 2/3's of the tomato sauce, Worcestershire sauce, basil. Heat through. Add ricotta and rice, stir well. Remove from heat and spoon mixture into the pepper halves. Remove foil from peppers, spoon remaining tomato sauce over and top with cheese. Bake, uncovered for another 5 minutes.